A brand new year and a brand new challenge! 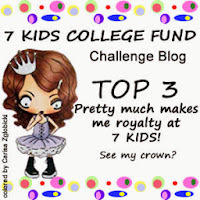 It's time for a new Anything Goes Challenge at 7Kids College Fund! The Design Team's challenge was to use white on white! I cheated just a little! I wanted to add a little sparkle to celebrate the new year, so I added some gold!! The sentiment, the mask, the champagne glasses, and the flourishes were all cut with my Silhouette Portrait machine. And then the fun began! I used lots of Stampendous Shabby White and Shabby Gold Fran-tage embossing powders. I covered the cut outs with Versamark ink first, and then sprinkled the embossing powders. I had glitter all over the place! Even my face!!!! The background was dry embossed with a Cuttlebug folder called Bit of Paisley. I added gold glittery stars to balance the gold embossing. I wasn't able to get a very good photo. It is so hard to show all the details in a photo with a white on white project! I hope you will join us with our new challenge for the new year! Gorgeous! Love all the white and gold...so festive! Wishing you and family a Happy New Year filled with many blessings! Very festive and very fun!! 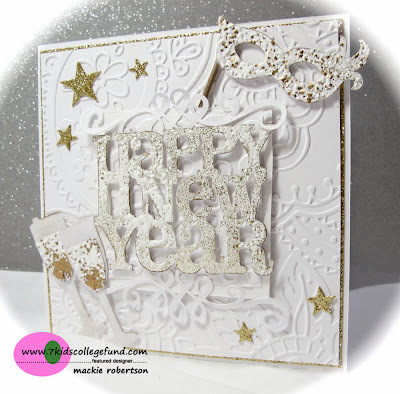 Pretty card Mackie, Happy New Year!!! Very festive card and I love that!! I love the mask, very creative for the New Year. Here's to you for 2014, do you see the toasting wine glass!! Happy New Year Mackie! What a stunning card! Love all the dimension and shimmery goodness! The all white with just a touch of gold looks wonderful Mackie! Beautiful card! I love the die cuts you chose....Your design is so festive. Happy New Year!